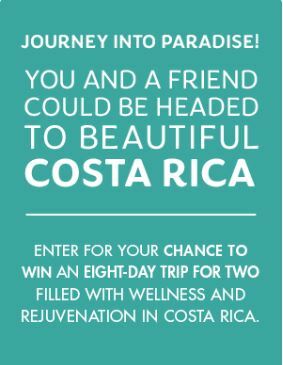 Enter now the Canadian Living Contest to get a chance to Win an eight-day trip for two to Costa Rica. To enter you simply have to visit the official contest web page and completely fill in the online entry form with your email address, name, last name, mailing address, city, province, postal code, phone number and birth year, agree to the contest rules and submit it. Contest closes on February 17, 2019 at 23:59 EST. Winner will be selected by random draw from all eligible entries. There is one Major Prize available to be won, consisting of an eight-day trip for two people to Costa Rica. The Canadian Living Contest will run from December 3rd at 10h00 to February 17th, 2019 at 23h59 EST. The prize draw will take place on February 19, 2018.